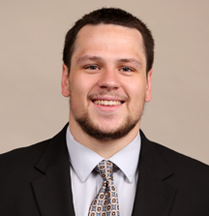 Toledo senior tight end Alex Zmolik has been nominated for the 2015 Allstate American Football Coaches Association Good Works Team. Every year, the Allstate Insurance Co. and the American Football Coaches Association honor college players who balance academics and athletics, while remaining committed to helping others and bettering their communities. Zmolik is a two-year starter for the Rockets. He had a career-high 16 receptions in 2014, helping Toledo to a 9-4 mark. His career-best six receptions were key in UT’s 63-44 victory in the GoDaddy Bowl last year. Zmolik, who earned Academic All-MAC honors in 2014, is a marketing and sales major with a 3.42 grade point average. He is the Rockets’ team leader for Fellowship of Christian Athletes and Athletes in Action activities. He also volunteers at the Boys and Girls Club a few times each month. During this past spring break, Zmolik traveled to Nicaragua, volunteering his time on a mission trip. 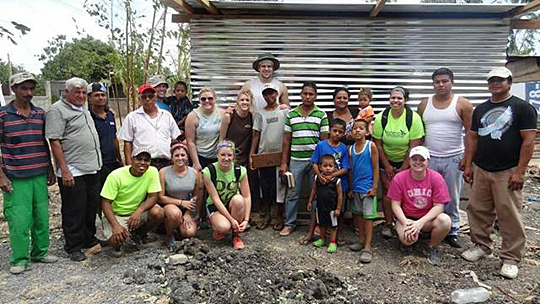 Alex Zmolik, center in back, spent his spring break on a volunteer mission trip in Nicaragua. A total of 197 student-athletes from all levels of college football were nominated for the award. A final roster of 22 award recipients will be unveiled in September. From the nominees submitted by sports information directors across the nation on behalf of their schools, a special voting panel consisting of former Allstate American Football Coaches Association Good Works Team members and college football media members will select the 2015 Good Works Team. Once the final team members are announced in September, fans are encouraged to visit the Allstate American Football Coaches Association Good Works Team website on ESPN.com, featuring profiles and images of the players, for the opportunity to vote for the 2015 team captain. This entry was posted on Thursday, August 6th, 2015 at 3:26 am and is filed under Athletics, News .